BCfresh cabbage is hand-harvested, trimmed and packed to order in the field. Cabbage is versatile and a staple in many countries. Cabbage is part of the cruciferous family of vegetables. Cruciferous vegetables are high in Vitamin C, Vitamin A and fibre. They’re also a great source of folacin, potassium and dietary fibre. Recent research by the American Institute for Cancer Research indicates that eating cruciferous vegetables is associated with reducing certain types of cancer. 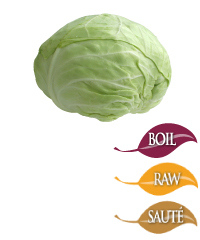 The “king of cabbages”, green cabbage is the most popular among cooks. The sturdy, pliable leaves make it the preferred cabbage for cabbage rolls. Local BCfresh cabbage is available mid-June through March. Cabbage is part of the cruciferous family of vegetables. Cruciferous vegetables are known for their cancer-preventing nutrients and antioxidants. High in vitamin C, vitamin A and fibre. Keep cabbages refrigerated at 32°F with 90 to 95% relative humidity. Cabbages lose moisture easily so trim outer leaves just prior to cooking as the outer leaves help prevent moisture loss. Handle carefully to avoid bruising. Refrigerate and store separately from ethylene-producing items such as fruit and tomatoes to avoid premature ripening. The flavour of red cabbage is deeper and earthier than its cousin the green cabbage. The leaves are dark red, thick, and pliable with a slight peppery taste. Local BCfresh cabbage is available mid-June through March. Imported product (Bestfresh) is available the remainder of year. 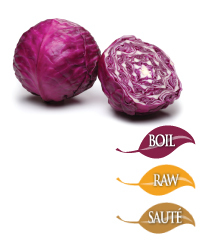 Red cabbage contains more vitamin A, vitamin C, and iron than green cabbage. Red cabbage contains an extra nutrient not found in green cabbage – anthocyanin – an antioxidant that produces the red colour, improves memory, and suppresses appetite. Savoy cabbage is the most attractive of the cabbages, with its dark green, crinkly leaves. The taste is mild and earthy. Savoy cabbage is low-cost, low-calorie, fat-free, and a good source of vitamin A, C, E, B6, B12, and K. Vitamin K helps the body form blood clots to stop bleeding. One cup of cabbage supplies half the vitamin K needed per day. Taiwanese cabbage is not round like a green cabbage. 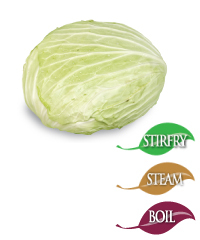 The colour is light green, but the cabbage has a flat head. The taste is sweet and mild with a crispy texture. Local BCfresh cabbage is available August through December. 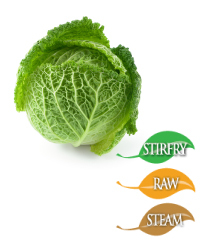 Green and savoy cabbage, and Brussels sprouts help breakdown and dissolve fats to aid elimination of toxins. Red cabbage can be used as a dye for clothes or food.